Kick off your visit on the 16th (Tue): discover the deep blue sea with a scuba or snorkeling tour. Mumbai, India to Cairns is an approximately 15.5-hour flight. The time zone difference moving from India Standard Time (IST) to Australian Eastern Standard Time (Queensland) (AEST) is 4 hours. When traveling from Mumbai in April, plan for slightly colder days in Cairns, with highs around 34°C, while nights are about the same with lows around 26°C. Wrap up your sightseeing on the 16th (Tue) early enough to drive to Port Douglas. On the 17th (Wed), see some colorful creatures with a scuba or snorkeling tour. Get ready for a full day of sightseeing on the next day: identify plant and animal life at Hartley's Crocodile Adventures, meet the residents at Wildlife Habitat Port Douglas, and then soothe aching muscles at some of the top local wellness centers. For where to stay, ratings, traveler tips, and more tourist information, you can read our Port Douglas trip planner . You can drive from Cairns to Port Douglas in 1.5 hours. Other options are to take a bus; or take a shuttle. April in Port Douglas sees daily highs of 34°C and lows of 25°C at night. Cap off your sightseeing on the 18th (Thu) early enough to travel to Katoomba. On the 19th (Fri), admire the natural beauty at Everglades Historic House and Gardens, take in the dramatic scenery at Wentworth Falls, then explore the world behind art at Norman Lindsay Gallery & Museum, then get great views at Elysian Rock Lookout, and finally tour the pleasant surroundings at Prince Henry Cliff Walk. On the next day, take in the dramatic scenery at Bridal Veil Falls, take some stellar pictures from The Three Sisters, appreciate the history behind The Road Builders Memorial, appreciate the extensive heritage of The National Pass, then don't miss a visit to Gallery Blackheath, and finally take some stellar pictures from Govetts Leap. To see other places to visit, traveler tips, reviews, and tourist information, go to the Katoomba visit site . Do a combination of shuttle, flight, and train from Port Douglas to Katoomba in 8.5 hours. Alternatively, you can drive; or take a train. Expect a bit cooler temperatures when traveling from Port Douglas in April; daily highs in Katoomba reach 28°C and lows reach 14°C. Finish your sightseeing early on the 20th (Sat) so you can drive to Sydney. Sydney is known for nightlife, trails, beaches, parks, and museums. 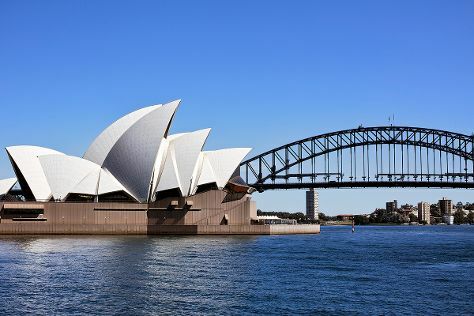 Your plan includes some of its best attractions: listen to music at Sydney Opera House, get to know the fascinating history of The Rocks, take in nature's colorful creations at Royal Botanic Garden Sydney, and wander the streets of Darling Harbour. To see other places to visit, ratings, reviews, and tourist information, use the Sydney trip builder website . You can drive from Katoomba to Sydney in 1.5 hours. Alternatively, you can take a train. In April, plan for daily highs up to 26°C, and evening lows to 17°C. Finish your sightseeing early on the 23rd (Tue) so you can travel to Melbourne. Melbourne is known for museums, shopping, parks, zoos & aquariums, and nightlife. Your plan includes some of its best attractions: take in nature's colorful creations at Royal Botanic Gardens, learn about all things military at Shrine of Remembrance, get lost in a book at State Library of Victoria, and admire the masterpieces at National Gallery of Victoria. For where to stay, maps, photos, and tourist information, read Melbourne online trip itinerary maker . Traveling by flight from Sydney to Melbourne takes 3.5 hours. Alternatively, you can do a combination of flight and shuttle; or drive. Prepare for little chillier weather when traveling from Sydney in April: high temperatures in Melbourne hover around 23°C and lows are around 11°C. 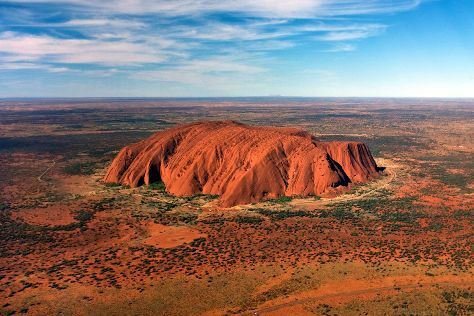 Cap off your sightseeing on the 26th (Fri) early enough to travel to Uluru-Kata Tjuta National Park. Start off your visit on the 27th (Sat): go for a walk through Lungkata Walk, then explore the activities along Mutitjulu Waterhole, and then explore the striking landscape at Uluru. Get ready for a full day of sightseeing on the 28th (Sun): hike along Kuniya Walk, then get outside with Walpa Gorge, and then take in the dramatic natural features at Kata Tjuta. To find photos, more things to do, traveler tips, and other tourist information, go to the Uluru-Kata Tjuta National Park journey planner . Traveling by flight from Melbourne to Uluru-Kata Tjuta National Park takes 5 hours. Alternatively, you can drive. Traveling from Melbourne in April, things will get somewhat warmer in Uluru-Kata Tjuta National Park: highs are around 34°C and lows about 17°C. On the 29th (Mon), wrap the sightseeing up by early afternoon so you can travel back home.